Playable City Lagos set out with a very clear purpose to create open, independent dialogue with real agency in Africa's biggest city. A new report tells the story of this unique project. We develop scores of international projects every year, each as unique in approach as befits a country’s social, cultural, economic and political context. People we meet are particularly interested in how we develop projects and what happens after they end. New report ‘Creative Construction’, tells the story of Playable City Lagos and sheds light on how our projects are shaped, how we work with partners and collaborators, and how everyone involved experiences and learns from the journey. Playable City Lagos, in partnership with Watershed, set out with a very clear purpose: to create open, independent dialogue with real agency. Debates around the cities strengths and weaknesses arose, along with thoughts on how the government could work closer with the creative and tech sectors to help design urban and rural solutions together. The programme was built around open learning, with much being developed in response to daily needs and experiences (no one is going to want to join a heavy discussion after they’ve just been doing a recce of the city in 45 degree heat!). No set programme, only set objectives; to work together in developing playful interventions to unite people and overcome small daily struggles in a city of over 23 million people. “Just the idea of play, play in an urban fabric. We don’t have that here… Anything to do with the arts is always on the backburner. The reality is people have to be able to make ends meet every day. So we get into a sequence of just work work work”. Tosin Oshinowo, participant. The word ‘Play’ certainly might seem incongruous when related to planning issues in a mega-city like Lagos, where two out of three residents live in slums. However, if you turn this term on its head, using ‘play’ to overcome daily obstacles, then it becomes more relatable. Pedestrian bridges, scattered every few miles along the motorway were mostly disused and many people were crossing the motorway with numerous road deaths each year. How could we use the notion of play in enticing people to use the pedestrian bridge? It’s amazing what you can do with some interactive mirrors! The project was about how people could play with their city and how creative approaches to urban and rural change are invaluable. Since delivering Playable City Lagos in March 2016, a few outcomes and thoughts have percolated. Personal networks have grown, professional development opportunities have been harnessed and the notion of play is being adapted amongst external partners in-country. Most importantly, our Nigerian participants have developed more ownership of their city and are helping others to do the same. “I went back to school to do a masters in public policy at the University of Lagos, to get into government… I am learning how to understand the numbers and statistics and the evidence behind policy decisions…but for me it always starts with the user, what the person on the street needs.” Gbadebo Rhodes-Vivour, participant. ‘Creative Construction: A new kind of innovation for your city: an evaluation of Playable City Lagos' was authored by Nesta. Please download the report here and visit Nesta's page all about this article here. We would like to thank, in particular, Jessica Bland, Tom Saunders and Benjamin Reid from Nesta for developing this invaluable, honest and revealing insight into our work. We're looking for an evaluator to evaluate the immediate outcomes of the project Playable City: Lagos in March 2016. This is an fantastic opportunity to be part of an exciting project in a dynamic context. How do Lagosians see their city? How can we imagine and create better urban futures? We took to the streets of Lagos to come up with the theme of our latest Playable City. We're looking for ten creative people to take part in a unique project based in Lagos, Nigeria, in March 2016. 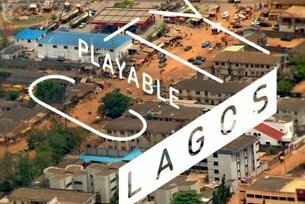 Playable City Lagos will explore playful interventions in a city of over 20 million. Find out how to get involved! CALL NOW CLOSED.